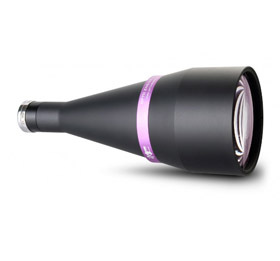 Opto Engineering TC UV Series Telecentric Lenses are specifically designed to ensure the highest image resolution today available in the machine vision world. No other lenses in the market can efficiently operate with pixels as small as 2 micron; for this reason TC UV Telecentric Lenses are a MUST for all those using high resolution cameras and seeking for the highest possible system accuracy. Common lenses and traditional telecentric lenses operate in the visible light range. The limiting resolution of a lens is given by the cut-off frequency, the spatial frequency at which the lens is no longer able to yield sufficient image contrast information.